An American dancer, Jerry Travers comes to London to star in a show produced by the bumbling Horace Hardwick. While practicing a tap dance routine in his hotel bedroom, he awakens Dale Tremont (Ginger Rogers) on the floor below. She storms upstairs to complain, whereupon Jerry falls hopelessly in love with her and proceeds to pursue her all over London. Dale mistakes Jerry for Horace, who is married to her friend Madge. Following the success of Jerry's opening night in London, Jerry follows Dale to Venice, where she is visiting Madge and modelling/promoting the gowns created by Alberto Beddini, a dandified Italian fashion designer with a penchant for malapropisms. Jerry proposes to Dale, who, while still believing that Jerry is Horace, is disgusted that her friend's husband could behave in such a manner and agrees instead to marry Alberto. Fortunately, Bates, Horace's meddling English valet, disguises himself as a priest and conducts the ceremony; Horace had sent Bates to keep tabs on Dale. On a trip in a gondola, Jerry manages to convince Dale and they return to the hotel where the previous confusion is rapidly cleared up. The reconciled couple dance off into the Venetian sunset, to the tune of "The Piccolino". Top star debut for Asaka Manato. Wikipedia article about Top Hat the movie. 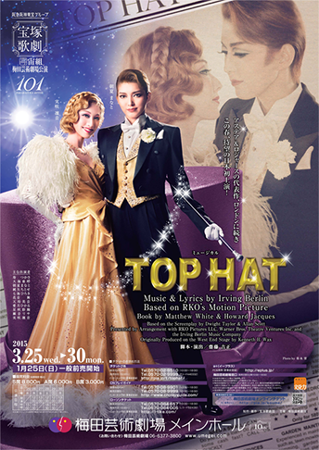 Wikipedia article about Top Hat the musical. Created by taelle. Last Modification: Monday 25 of February, 2019 06:59:21 PST by caithion.